Think you just saw a plate of assorted sushi? Look again, this time more closely. Häagen-Dazs Indonesia launched this intriguing item mid April and damn, it did arouse me (and my sister). 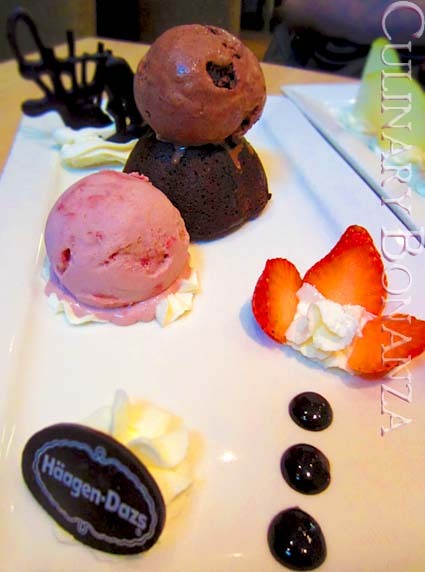 So today, the two of us, fully determined to finally get our hands on this unique treat and with the aid of my sister's BCA credit card (with which, we're entitled for the 'Pay 1 for 2' promotion), made our way to the nearest Häagen-Dazs outlet at EX/Plaza Indonesia. The outlet at EX can barely be called an outlet, it's more like a tiny space with a few tables for guests to sit at. So the ambiance didn't really matter to us, what's important is we get to try the sinfully treat, ASAP! Oh well, it's Häagen-Dazs! Can you find anything to critic (except for the calorie content that's probably worth your entire lunch)? 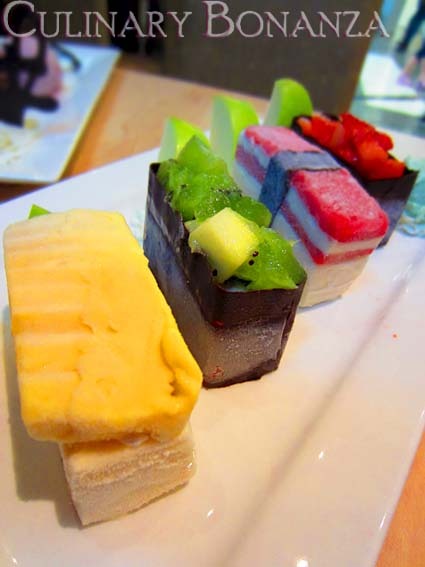 I love the ice cream, which, itself, is already indulgent, but shaped like a sushi? We're not paying for quantity, but more for the artwork. Rather unfortunately, contrary to the claim stated in the menu, the ice cream melted quickly, so we had to consume it in a rush, before these turned into a gooey & colourful mess. To be honest, taste wise, both me and sister liked the Love in Belgium better, 2 scoops of ice cream (your choice of flavours) and a piece of chocolate lava cake. The cake is supposed to the warm and liquid in the center, but I suppose Häagen-Dazs keep it in the fridge, so ours were rather chewy like chocolate fudge. But it was still equally good, especially with the Belgian Chocolate Ice Cream! how great does the 'sushi' looks? oh so creative! Waduh salah ni baca post lo pagi2.. Langsung ngidam sayaahhh..
@irene: Agreed, pieces of artwork.